Mr. Clark, currently Owner, Chairman, and Chief Executive Officer, of G.W. Peoples Contracting Company, Inc. (GWP) has built an impressive three-decade career, building and managing two national rail construction companies. Armed with the spiritual and moral teachings imparted to him by his father, a nationally-known evangelical minister and COGIC Bishop, he graduated from Pennsylvania State University, followed by JD and MBA degrees from Northwestern University. Mr. Clark then began his legal career with a prominent Pittsburgh law firm, as a corporate and labor attorney, prior to joining the Tax Division of the U.S. Department of Justice. In 1983, Mr. Clark, with his father’s support, founded Metroplex Corporation, the nation’s first minority-owned railroad construction company which he grew into a nationally-known and widely-respected leader in its field. The company won multi-million dollar contracts for prestigious transit projects across the country, including the Alameda LRT Corridor in Los Angeles ($65 million), the Bay Area Rapid Transit Project in San Francisco ($35 million) and the New Jersey Transit Project in Camden ($50 million). In 2000, Clark sold that company to Balfour Beatty, a U.K.-based construction/engineering firm. In 2011, Mr. Clark acquired full control of G. W. Peoples, and under his leadership, expertise, and vision, GWP now boasts a successful turnaround, producing over $22 million in annual sales. GWP was the DBE rail contractor for the Chicago Transit Authority’s (CTA) rehabilitation of the Dan Ryan Red Line, a $425 million project to upgrade 10.2 miles of the CTA system where, GWP was able to ensure that over 70 percent of the its workforce on the project was minority (men and women). GWP also built the Atlanta Downtown Streetcar Line, and constructed the Norfolk Light Rail Transit System for Hampton Roads Transit. 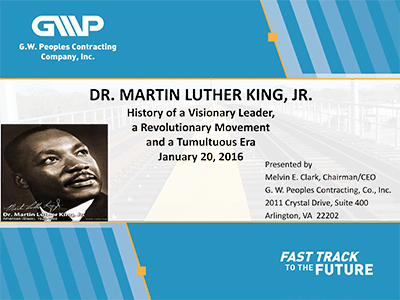 Currently, the firm is aggressively recruiting, hiring and training inner city residents for GWP jobs working on the SafeTrack rail maintenance project for the Washington Metropolitan Area Transit Authority (WMATA). GWP has partnered with Dwayne Sampson, CEO of the Transportation Diversity Council (TDC), to recruit, hire and train up to 50 graduates of the Bronx Design and Construction Academy (BDCA) for employment on the SafeTrack project. Mr. Clark visited the BDCA to see first-hand how the students were engaged in acquiring the requisite industry skills and declared his appreciation for the opportunity to become aligned with the school. He subsequently became a featured speaker at their graduation. Mr. Clark is proud to offer these recent graduates a true opportunity to better support themselves and their families, while at the same time addressing the severe unemployment in the inner city. Working as an agent of change in Washington, Mr. Clark helped establish a Mentor–Protégé Program for the Small Business Administration in the mid-1990s designed to pair minority-owned businesses with large firms with the goals of providing marketing and financial assistance, and facilitating procurement of federal contracts. Mr. Clark and Metroplex signed the SBA’s first Mentor-Protégé agreement with GWP, then a small struggling contractor. He had also previously received Presidential appointments to the Boards of the Pennsylvania Avenue Development Corporation, the United Service Organization, and the Overseas Private Investment Corporation. Mr. Clark was a private sector representative for the U.S. State Department at the UN Trade and Development Conference in South Africa. He was also a member of President Clinton’s White House Mission to Africa and a member of TransAfrica Forum’s coterie to Haiti to provide assistance to the country’s depressed economy. Mr. Clark is an active member of YPO, an executive education organization of more than 20,000 presidents and CEOs worldwide, all committed to the exchange of ideas and shared experiences. Importantly, Mr. Clark is also a founding member of Black YPO, created to focus on interactions and experiences unique to minority executives. He serves as Trustee for the Church in the Round in Aliquippa, PA, and supports the church and Beaver County, PA’s local Family Life Center with his time and through his generous financial contributions. A member of the international African-American Fraternity Omega Psi Phi, Mr. Clark is a true role model for our next generation. The hallmark of Mr. Clark’s success has been his legacy of breaking down the sometimes-imposing impediments of exclusion, discrimination and intolerance. Mr. Clark relies on a simple and effective adage: “Do well by doing good”. 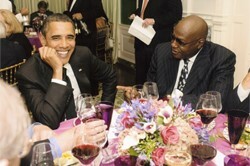 Still an aggressive advocate for small and disadvantaged business concerns, Mr. Clark acted as an advisor to the White House Task Force on Small and Disadvantaged Business during the Obama Administration, and serves on the Executive Committee of the Congressional Black Caucus Institute’s 21th Century Council. The CBCI launched the 21st Century Council to identify issues key to ensuring a sound future for all Americans and to provide workable solutions to the White House and U.S. Congress to meet these challenges. In his leadership role at GWP, Mr. Clark will continue to mentor and advise senior management on all aspects of marketing, management, and construction decisions. Indeed, he has re-energized G.W. Peoples, and positioned it as a premier rail contracting company to take advantage of the substantial growth potential occasioned by a welcome renaissance in the rail industry.